It all began with a stone, Or so the legend says. In ages past, a sentient jewel, enormous and beautiful banished the darkness. Its many-colored light filled the world with life and brought forth mighty Gods. Bathed in that light, the world entered an age of bliss. Until, after a time, the Gods fell into slumber. That world was called: Vana'diel. The western continent of Quon, host to the Kingdom of San'Doria in the northern forest belt, and the Republic of Bastok in the strip-mined southern region, is the larger of the two. Its climate ranges from cold and snowy in the northern end, to the warm deserts in the southwest whence the Galka originate. The eastern continent of Mindartia is the smaller of the two and is mostly covered with rocky badlands, but it has lush and ancient forests where trees touch the skies in the east. It's host to the Federation of Windurst in the savannahs to the south, and on a volcanic island across the southeastern sea is the Mithran jungle outpost of Khazam. The two continents are connected in the middle by an intertwined network of long bridges, in the center of which the great multi-tiered city of Jeuno is built. The grand duchy of Jeuno is the central trading hub of the middle lands. Throughout both continents, there are several gigantic, bonelike structures called crags, made from a material called ceremet. These crags are remnants from an ancient civilization, and contain magic and technology which is no longer fully understood. The crags are connected with each other through spiney lines stretching out across the lands both above and below ground. Off the coast of Jeuno is the crescent shaped island of Qufim upon which the lines all converge at Delkfutt's Tower. Like in most «Final Fantasy» games, the fate of the world and its inhabitants are closely tied to magical crystals of great elemental power. 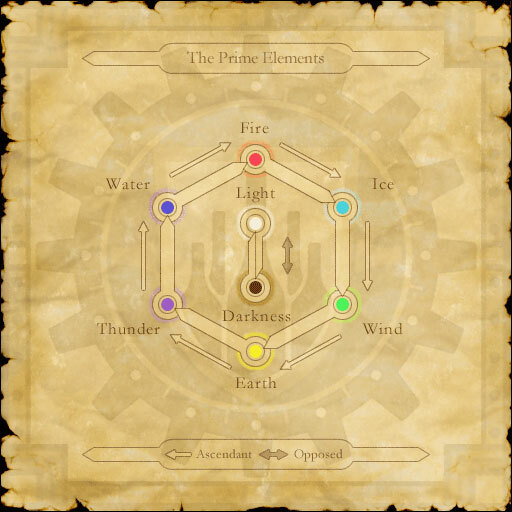 As the world sprang forth from the light of this elemental force, most aspects of it has a direct connection to one of the eight prime elements: Light, Fire, Lightning, Wind, Darkness, Earth, Water and Ice. All living things have an elemental affiliation, and leave behind crystals of the appropriate type upon death. These crystals are the primary drivers of the Vana'diel economy, as crafts use them as catalysts in the production of goods. Even things like the weather and the passage of time are linked to the elements. 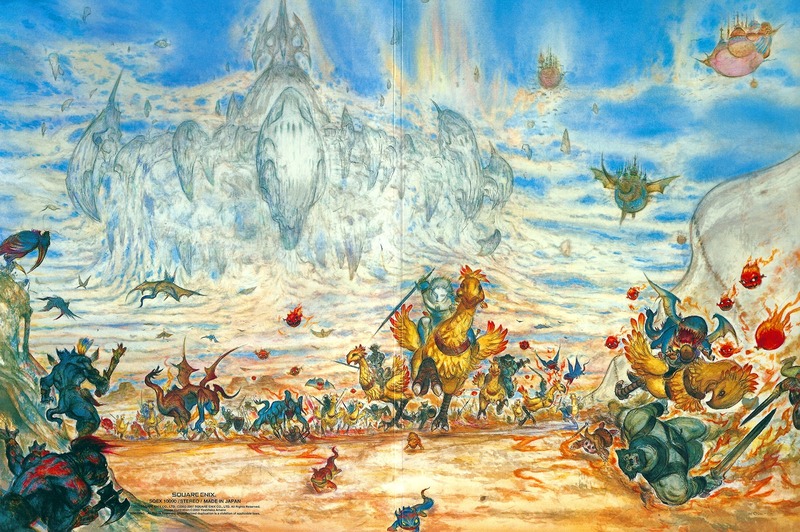 A Vana'diel week has eight days, and each day is named after one element. There is likewise a corresponding relationship for each of the eight types of weather. Magic is especially affected by the elemental tides. Casting a lightning-based spell on Lightningsday will boost its damage. The effect is increased further if there is a thunderstorm in the area. Each element is stronger or ascendant to another element. For six of these elements, each have one element which it beats and one which it's weak to, thus balancing them in a circular fashion. The elements of Light and Dark have a special relationship in which they are directly opposed to each other. Interactions between elements can be readily applied to combat. As in most fantasy settings, it's possible to blast your enemies directly with lightning and fire spells if you are a wizard, but even if spell-slinging is not your thing, the elements can still be part of your arsenal. As you level up with a weapon, you gain the ability to channel latent elemental energy from the environment into special attacks called weapon skills, which are the Vana'diel version of "Limit Breaks" used in other «Final Fantasy» games. In addition to being more powerful than regular attacks, the elemental attributes of these attacks can be combined to form skillchains (Renkei). A skillchain is performed by hitting a target with a series of weapon skills containing compatible elemental attributes. When a skillchain is performed correctly, additional energy in the form of a colorful explosion is released. This explosion deals elemental damage, and will also boost the effect of any spells of the same element cast at the target for a short time afterwards. When this happens it's called a magic burst. There are many different types of weapons in the game, and each type can do several different weapon skills, each of which may have more than one elemental property. The logic of constructing a skillchain by way of which weapon and which skill to use, is unfortunately not easily deduced. Mainly because the elements used to construct it tend to be different from the elements of the resulting effect. and second level (double circle) skillchains. Valid combinations can be derived from the array to the right, but it's usually easier to just consult a dedicated skillchain chart. There are three levels of skillchain effects. Each level incorporates more elements, and provides higher damage bonuses to both the effect itself and eventual magic bursts upon it.